Chris Lee can be seen standing over a seated Timothy Lam and ordering him to leave the conference room on Wednesday. Lam initiated coverage on PAX Global’s stock in April with an underweight rating, making him the only analyst out of 17 tracked by Bloomberg to have a bearish recommendation at the time. Asell-side analyst’s relationship with the management is so important, they can receive further insight into the business, easily arrange meetings for their clients and some of the time you’ll even see those sell-side analysts join the firm’s that they wrote reports on. It’s not the individual’s fault its just the way the business is. I’ve heard from a friend that he also received negative treatment from the CFO of an airline company here for writing a negative report on them, you can probably guess which one that is…. I wrote this memo to explain what happened in the UK this year and what I think is happening in the U.S. I wanted to point out that politics rarely hews to economic reality; rather, it has a reality all its own. The recent trends in income, wealth, trade and employment are causing a lot of dissatisfaction in the U.S. and Europe, and I expect them to have a strong impact on politics for years to come. Widespread economic dislocation can cause voters to choose the wrong leaders. The U.S. is not exempt, and we must be highly vigilant in this regard. 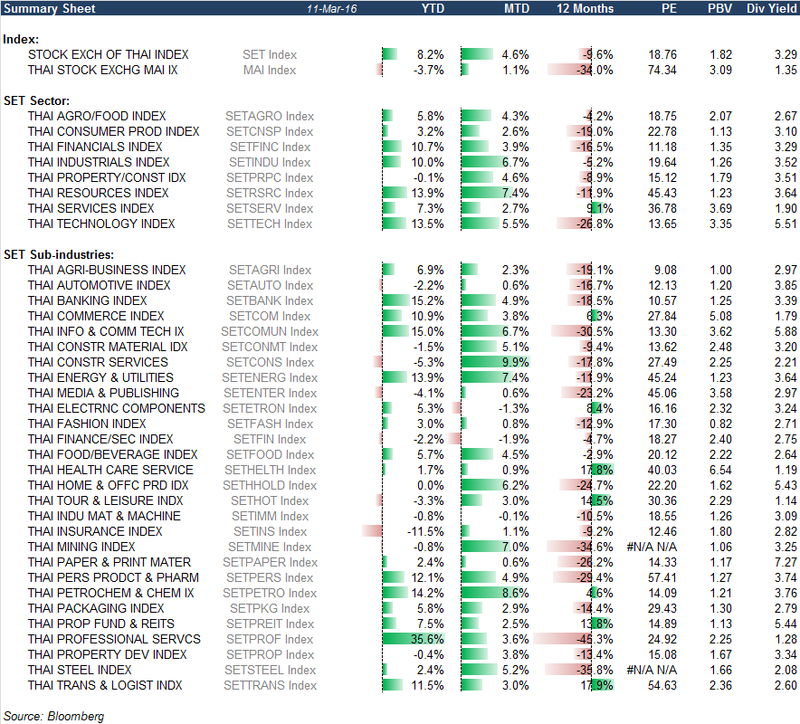 And the roaring start to the year continues for the SET, up 8.2%, driven by resources, tech (read telcos) and financials. 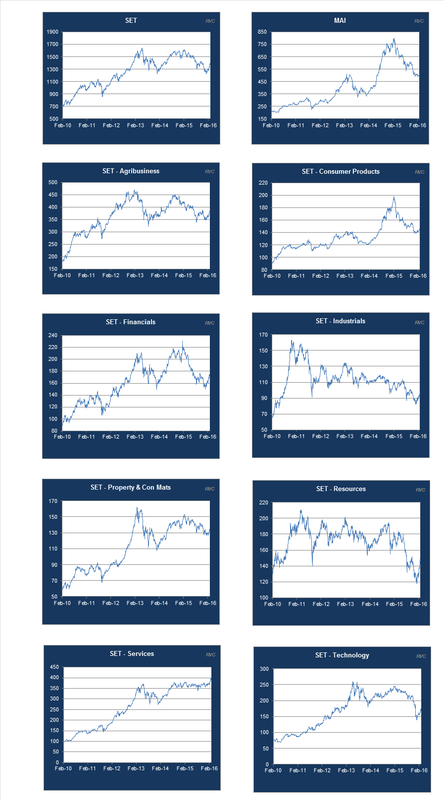 Earnings last year were so-so @ best given the multiple write-offs by the resources sector, insurance seems to be suffering this year along with the MAI index still down -3.7%. Now we wonder aloud…with prop traders having accumulated a total of THB 15 bn, when they sell who will be picking up their shares? Comment: I’ve always liked the potential of the Philippines, and given that Beauty’s products are “cheap” i.e. 20 cents of 10-20 baht / unit it could do very well. Or is this just news from another company that they are expanding internationally and nothing will come out of it. Comment: Less funding for the government to do upcountry loans? 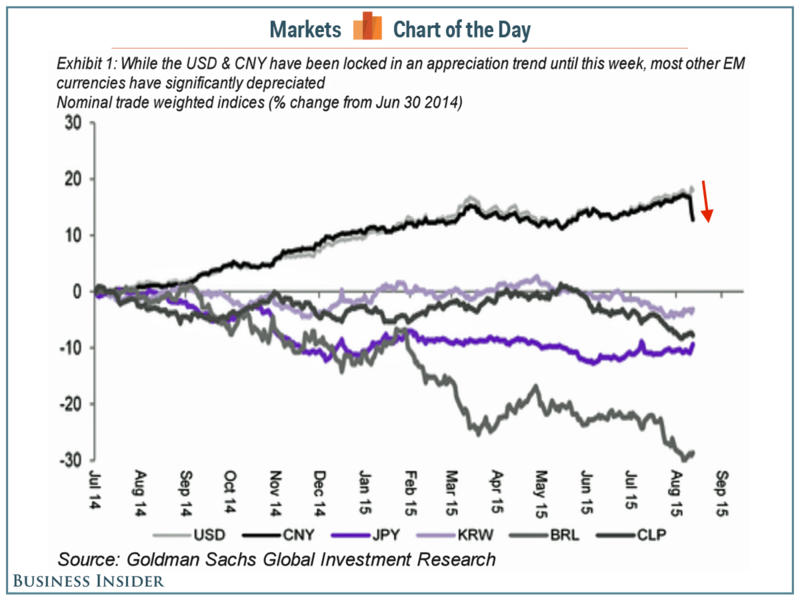 The evil chinese are devaluing their currency to ruin the world! Right…that’s the headline I’ve been reading the past few days, and this is the only chart that I care about at the moment. China is now following a path that many other advanced and emerging economies have been attempting to take for some time (including the euro zone via the European Central Bank’s quantitative easing program). Indeed, China’s decision leaves the U.S. as the only systemically important country willing to accept the strengthening of its currency. But what may work for individual countries cannot work for the system as a whole; and that has implications for financial markets. Isn’t it convenient that this occurs the month before the head of China goes to the US and the month where the Fed is supposedly going to finally raise interest rates? Japan has devalued its own currency vs the RMB and the USD by some 30% in the past 12 months, perhaps that’s where it all started? Isn’t this all just a race to the beginning? Every country tries to devalue their currency, exports deflation and in the end currencies return to where they started? 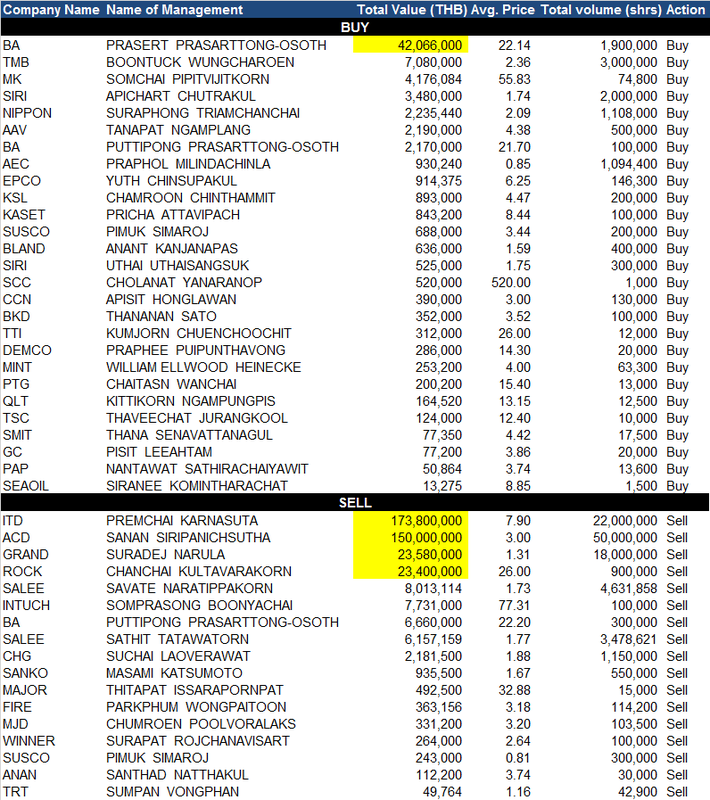 ITD – And the exact opposite of BA, here K. Premchai continues to sell his shares! ACD – The President and major shareholder sells over 10% the co, to who and why? GRAND – Is the family thinking that this deal with PF isn’t wonderful? I’m off to London for the week, posts will be light if non-existent. The funniest scene emerged at NMG’s AGM yesterday where police were called in to prevent a portion of shareholders, specifically the SLC group, or News Network as they now call themselves, from entering the AGM. This sparked chaos in front of the meeting room as the angry shareholders tried to break into the room. This led to the arrival of 50 police officers from nearby police stations who came to control the intense situation and prevent a confrontation. 1. Shareholders, no matter what their agenda, should always be allowed into an AGM, NMG was definitely wrong in this case. 3. If they were so worried about News Network electing a member to the board, so what? In theory they only own 12% of the shares, 75% of attending shareholders need to pass it by Thai law, and even if 1 additional member is added to the board, again so what? 4. The obvious hypocrisy from NMG is that, it is a publicly listed company, it has raised funds from the public multiple times, and now that the some shareholders perhaps want some change, NMG is barring them from having a voice, sooooo, yeah a bit unfair. It’s quite humourous and yet sad to see that minority shareholders viewpoints are respected. Disclosure: I’m not a shareholder in either co.